In the second year of the World House Project, the IwB began a partnership with Costa Rican Ministries of Culture and Housing. The project addressed rural renewal in the developing Guanacaste region. Focusing on the town of Matapalo, a small but fast-changing municipality, the project explored ways to balance the impact of global tourism on local communities. The IwB designed a 60 square metre green, social housing prototype unit, a process for co-creating vibrant sustainable public village squares and a regional plan linking resorts with the villages that surround them into a more holistic tourist ecosystem. The project also touched on social justice issues of affordable and dignified housing for migrant workers building resorts and green infrastructure such as biogardens in rural areas. To deliver viable and sustainable housing solutions to the communities of the Guanacaste region in Costa Rica, a quickly changing, urbanizing and globalizing area. Matapalo. A hotspot in the escalating collision between the global and local. It’s here and in thousands of places like it that we see the interconnectedness of our world. The IwB design for the central plaza in Matapalo, featured in the publication below. Matapalo, a town at the crux of local and global forces, read more below. When things change in Guanacaste, they change fast. Once a series of ranching communities that seemed doomed to die out, Guanacaste is now a global investment hotspot. Along the roads of the Guanacastan coast, new resorts multiply and it’s fast becoming a second home and a favourite retirement spot for foreigners. For the local inhabitants, the effects of the economic boom are mixed. Like many coastal regions around the world, Guanacaste is seeing the growth of densely urbanized strips along the coast, with flourishing economies that are scarcely connected to the hinterland. Populations now fluctuate with the seasons, swelled by migrant workforce and tourism. The investment is reinvigorating what were dying communities, bringing new opportunities to the service sector and making it possible for people to find work locally. On the other hand, rampant commercial and tourist sprawl has meant serious social and environmental inequalities and problems. For instance, one formally idyllic beach community had to close down its beach due to excessive pollution. Mass tourism brings opportunity but also dramatic changes to the local landscape and culture. Distinct tensions exist between globalized and local cultures in the Guanacaste region. Local communities are seeking ways to come to terms with these changes. In year 2 of the World House Project, the IwB began a project to address these issues in Costa Rica. The project was spurred by the work of an IwB student and native Costa Rican, Giorgiana Penon, who uncovered an opportunity in her homeland. Penon’s initiative became a proposal for rural renewal in the developing Guanacaste region on behalf of the Costa Rican Ministries of Culture and Housing. The Government of Costa Rica asked the Iwb to create models for sustainable communities in the new investment hotspot of Guanacaste. Matapalo, a small town in western Guanacaste, served as a case study community within the Reserva Conchal catchment areas. A former agricultural centre, the town was being overtaken by tourism development, driving living costs up and displacing locals. Matapalo, like other communities in the area, at the time had no development plan and faced growing problems on many fronts. A green social housing prototype for rural areas that could be implemented to meet the needs of the growing population and accommodate local families while providing temporary accommodation to migrant workers. The housing prototype is explored in the World House Costa Rica Project Book. a regional plan balancing tourist resorts and their surrounding villages into a more coherent and exciting tourist experience. The solutions purposed were economically, culturally and environmentally suitable for the region, helping the Costa Rican Ministries envision better rural development and renewal for the future of the Guanacaste region. Using the case study of Matapalo, an extensive proposal for the Matapalo Town Square was developed that is outlined in the Plaza de Matapalo: The World House Project Costa Rica book. 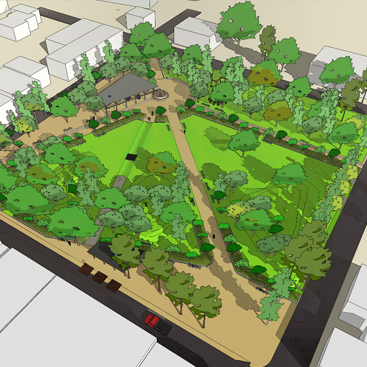 The proposal offered a new vision for co-creating a revitalized town square in Matapalo that includes a complete redesign of the square that serves the needs of both residents and visitors that includes a new market shelter and carts, a new bus shelter, landscape redesign using diverse local plants, a rainwater collection system for irrigation and stormwater management, an event board, a playground as well as many other improvements. Developed using the World House Matrix, the plan levers a systems approach and community engagement to develop public spaces incrementally over time. The IwB also developed a proposal for an interactive design tool called the Dashboard, outlined in the Dashboard IwB publication. The Dashboard was made to navigate design projects by organizing and filtering information. It is a useful tool when presented with complex design challenges. The Dashboard layers and overlaps information to make it easier to grasp the complexity of the problems at hand, helping to orient, classify, evaluate, and revise a project to generate better design solutions by developing a dialogue between designer and client on the nature if the design collaboration. The Dashboard was used to approach the Matapalo Town Square Project and other proposed projects for Guanacaste like investigating ways to create ecotourism in the Guanacaste region. It provided a framework to address multiple clients and different levels of interaction, while demonstrating sensitivity to local cultures and communities. All the projects proposed by the IwB for Matapalo and its surrounding Guanacastan communities, dealt with the idea of interzones, spaces that both tourism and local communities can share and benefit from. These include but are not limited to natural, cultural, infrastructural, and economic interzones. The IwB’s work in Costa Rica also verified the collaborative and co-learning principles of the IwB illustrating that a student initiative could become one of the Institute’s major curriculum projects. On the whole, the Costa Rican project was about trying to find the balance in power relations in Matapalo and Guanacaste as a whole. In Costa Rica, there are many inequalities and a delicate balance between local and global forces. Understanding power relationships in Matapalo and Guanacaste meant not trying to decipher whether the area is more local or global, but acknowledging the locally and globally enforced inequalities and forces that have shaped it, and trying to find a balance of power that derives benefits at the local and global level. The project resulted in a deep commitment by the IwB to the principle of glocalism. In Matapalo, global tourism helped to alleviate poverty by bringing investment to the area, but it also brought negative effects and heightened the wealth disparity between locals and foreigners. For instance, the new tourist resorts gave new employment opportunities, but it also monopolized the town’s water resources. Thus, global investment does not necessarily improve local communities if there is no synergy between the needs of local and foreign needs. The concept of ‘glocalism’ looks to resolve the shortsightedness of global investment and by asking how does the global help the local? And how does the local enhance the global? 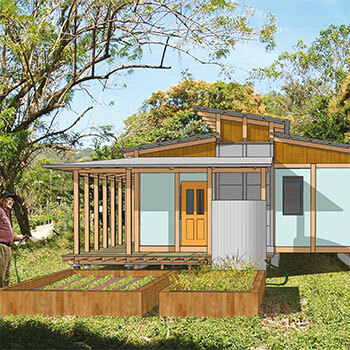 This charrette brought together students from the IwB and the Veritas University architectural program to create solutions for the World House Costa Rica Project. Presentations from both schools on social housing unit design preceded the charrette and served as a basis for further investigation. What type of thinking could influence the house for Costa Rica? As part of its preparatory work, the IwB began super solutioning the house design for the Costa Rica Project in Toronto with the aid of architectural teams from different offices and schools in North America and Europe. The results of the joint work were published in Building Magazine. The exercise also showed that to truly address Costa Rican housing challenges the Institute would have to reach beyond the box of professional architectural practice and explore other types of thinking. Mike Dole, an industrial designer working with the IwB, suggested bringing the project to the Elizabeth Simcoe Junior Public School, where he was a parent volunteer. Dole proposed the IwB explore housing design for Costa Rica with the school’s kids. The children reached to basic encyclopedic knowledge and began studying the people of Costa Rica and the country’s climate and geographic conditions. The kids started to imagine a house that could withstand earthquakes and volcanoes. Ironically, their designs, unlike the 45 professional proposals, were the only ones to focus on housing that could withstand the Costa Rican climate. The exercise underlined the IwB’s core belief that diverse intelligences are critical to the design process. When you are too cohesive a group you fall into the trap of coming up with similar solutions. Everyone should be included in the design process; an inclusive design process makes for holistic design solutions. The IwB students developed conceptual prototypes for accessory living units for a hypothetical site in Toronto. This charrette took place in Matapalo, Costa Rica. Over the course of one day, the Institute’s students and faculty met with Matapalo residents, Costa Rican NGOs as well as local partners, to discuss concepts for community revitalization including: the design of a social housing unit, and a town square and a master plan. The results of this charrette were later developed by the student team as a detailed proposal for the Government of Costa Rica. An IwB online charrette with international schools to design affordable, sustainable housing for low-income residents in Guanacaste, Costa Rica. This was a major charrette that was conducted in collaboration with Building Magazine. It involved an open-call competition to students and professional around the world that received 45 different entries. Learn more about the projects and read the charrette review in Building. While working with the Costa Rican Ministries of Culture and Housing to try to implement a new housing prototype throughout the Guanacaste region, the IwB got involved in a water waste management project in Matapalo. Ana Hindelang, one the IwB students, connected the Institute with an NGO specializing in rural restoration and waste water management. Working together and holding a short charrette, it was clear the community needed help with waste management. The NGO helped to design a biogarden system for the Matapalo Elementary school. A biogarden cleans waste water that is then stored in a small tank. The resulting water is clean and can be used in the garden, making the school self-sustaining in terms of its water needs. In an area that remains dry 6 months of the year, the biogarden system made a huge impact on the lives of the community that could store and recycle its water resource. Ironically, the housing prototype developed by the IwB was never implemented in Guanacaste because of administrative hindrances in the regional and federal government. But joint action, between the IwB, the local community and NGO support, produced the most concrete result, bringing a simple, but profound and immediate change to the lives of people of Matapalo. In January 2008, the IwB students participated in the Toronto Interior Design show. The students developed a newspaper called “The Ideator,” explaining the IwB and World House projects for the government of Costa Rica. The Ideator discussed the IwB’s experiences in Costa Rica and showcased the Institute’s designs for a social housing prototype unit, its work to make vibrant sustainable public village squares in the area, and the completion of a regional plan linking resorts with villages to make a holistic tourist ecosystem. For more information on this exhibition see the IDS Student Booths project page. The students developed and prototyped the Dashboard tool that provided a menu of design options, assisting the user to plan and execute real-world projects. The Dashboard publication, viewed above, outlines this tool. Throughout 2007-2008, the IwB developed sustainable housing models for lower income families in the Guanacaste region of Costa Rica. The house promotes scalability through local modular systems and responds to the region’s climactic, geographical and cultural context. Learn more about the Costa Rica House in the World House Costa Rica publication featured above.